A century ago, a couple named the Brintons from Washington, Iowa, assembled one of the world's great collections of silent films. Now, a historian in the town, Michael Zahs, has rediscovered and rehabilitated this trove - and in the coming weeks you can sample it as one of Iowa's most creative musical groups, Red Cedar Chamber Music, tours our state, accompanying the films with its unique mix of live music. 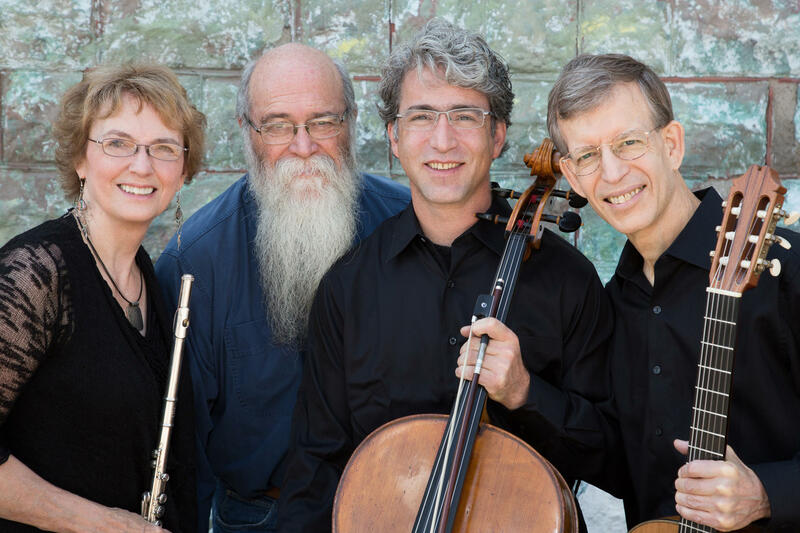 Red Cedar Chamber Music - Jan Boland, Carey Bostian, and John Dowdall. The man with the magnificent beard is Michael Zahs, the Washington, IA, historian who rediscovered and restored the historic collection of silent films collected by the Brintons in that town around the turn of the last century. They call it "The Brinton Silent Film Project," and last week they came to IPR's studios to perform a live preview set. You can listen to it by clicking on the arrow below. In the first eight minutes I interview the group; then at 8:30, I turn the floor over to Red Cedar. Before each piece, they describe the film scene it accompanies - and once again, radio lets you "see" things! But I'm told the events are as fun for children as they are for adult film buffs, so I recommend checking redcedar.org for a schedule of the events. Red Cedar Chamber Music's live set at IPR, recorded March 20, 2015, and hosted by Barney Sherman. The concert starts at 8:30.